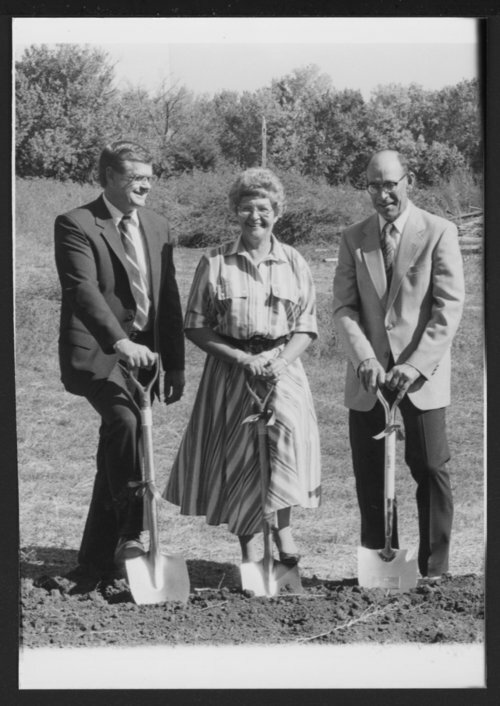 This a photograph of DS&O Rural Electric Cooperative's officials participating in the ground breaking ceremony for Kansas Electric Cooperatives, Inc. (KEC) in Topeka, Kansas. Participating were, (left to right) Jerry Rumbaugh, manager of the cooperative; Ramona Johnson, Assaria, Kansas, serves on the KEC Woman's Executive Committee; and Eldon Johnson, Assaria, Kansas, a trustee on the DS&O cooperative board and a member of the KEC Board of Trustees. It was named DS&O because members were from Dickinson, Saline, and Ottawa counties.